Did you know that most of your trash is recyclable? You can repurpose your old bikes, books, and vinyl records locally. We have written such a guide, The Re-Directory. You can also recycle things you probably did not realize you could, such as sneakers, baby food pouches (and just about any food packaging), binders, cigarette butts, etc. See www.TerraCycle.com and be amazed. convening a Green Team to promote sustainability efforts, auditing our environmental impact, and launching exciting projects. 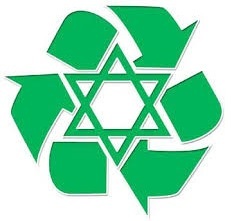 Learn more about the Hazon Seal of Sustainability at www.hazon.org/seal. Please contact Mark Lipsy at remark1@gmail.com, or Harriet Sepinwall at hrls5@hotmail.com at to help.